One of my children used to have zombie nightmares. Not your run of the mill, average “don’t worry, it was just a bad dream” sleep disturbances – full on 3D IMAX extravaganzas occurring frequently enough to deserve a creative solution. Rather than trivializing or poo-pooing Zombie dream invaders, we became a Zombie escape and defense plan family. With the same matter of fact thinking applied to fire or earthquake scenarios – Zombie invasion made the list – no more or less important, simply considered from all angles, openly discussed then placed on the shelf within easy reach. Understanding your enemy is the first step – driven by instinct they can’t form strategies, have no interest in nor ability to zombify the family pets, can’t swim, and can only be put out of their misery by destroying their brain. Armed with practical knowledge, “what ifs” became second nature. “What if” they attacked our house? How about while driving or at the grocery store? What if they came while on vacation or in unfamiliar surroundings? We had practical, fighting chance answers to all those questions. It wasn’t long before Zombie night terrors became infrequent annoyances. Stripped of all consuming horror by acknowledgement and solutions. Along the way offering years of entertaining, hypothetical debate. 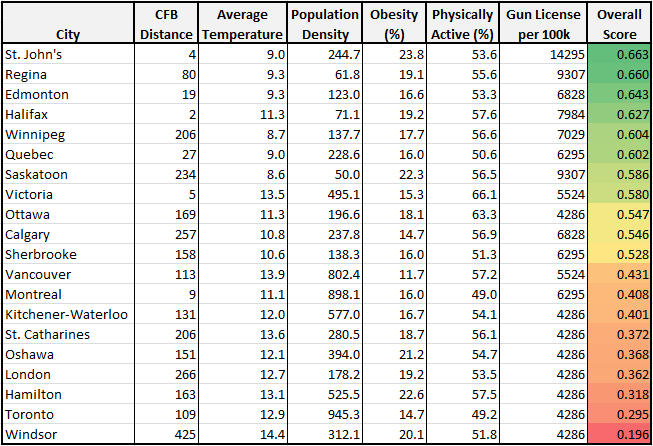 Michael Ross, a University of Alberta Engineering grad recently compiled a list of Canadian cities most and least likely to survive a Zombie attack. Based on criteria such as population density, proximity to military bases, climate and obesity/fitness – his conclusions are linked below. Naturally gun ownership was a factor – knowing what I do about Zombies I highly doubt our gun toting neighbors to the south should shrug off or exclude Zombie outbreaks from their list of paranoia. For Americans seeking their chance of surviving a Zombie apocalypse click on the link below.